Robyn’s Online Spring Retreat in a Box Preorder! Are you ready for my Spring Retreat in a Box Preorder?! Well, I am! It’s going to be so much fun!! Here is how my online retreats work. You preorder the box, I order the product, it ships to me where I prepare all of the packets for each class, then I fill your box with your classes & goodies and ship it to you! I will also email you over 3 online class videos so you can do all the projects in the retreat! **If you own ANY of the items listed in the class…. no problem!! 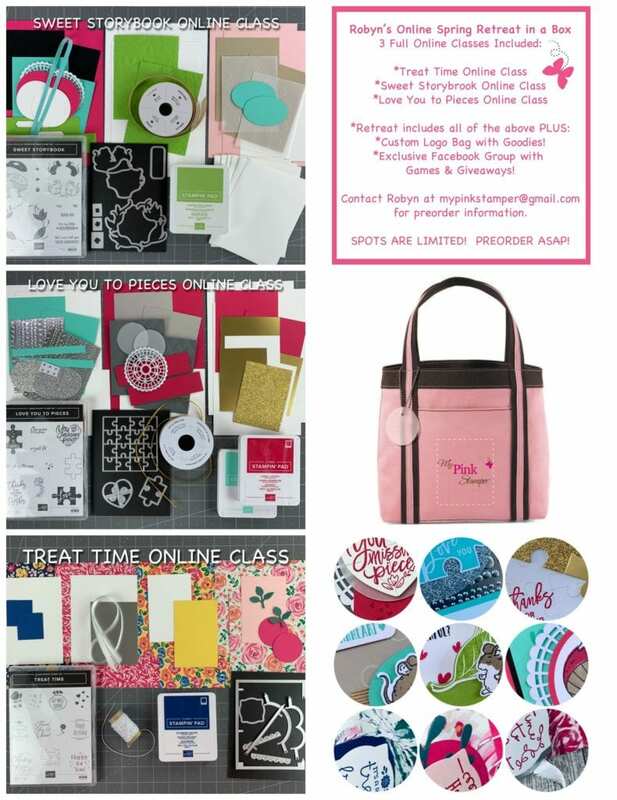 Just simply email me at mypinkstamper@gmail.com AFTER you preorder and let me know what substitutions you would like! Here is what comes in Robyn’s Spring Retreat in a Box!! *You get to make 12 cards with envelopes & 8 sour cream containters as a GIFT from me! You will only be paying for the stamp sets, framelits, and what I have listed! *EXCLUSIVE Facebook Group that is ONLY for those who preorder the Retreat in a Box!! I will have giveaways & goodies posted in the new group! *EXCLUSIVE to my retreat members ONLY! Custom mini My Pink Stamper Logo swag bag that will be perfect for putting your scissors, adhesive, & embellishments into when crafting! *You also will only be paying $13 for EVERYTHING to ship Priority back to you! Normally 3 classes would be over $24 to ship back to you. *This box will be stuffed with not only my “swag bag” but I will also have treats & other surprises!! You are going to LOOOOOVE this amazing retreat and the best part is that you can do it all from the comfort of your own home in your JAMMIES!! *These classes will NOT be available A La Carte or by themselves at this time. *FREE roll of Silver & White Bakers Twine as a gift from me! *EXCLUSIVE online class video that will be emailed to you to watch whenever, wherever, or as many times as you would like! *FREE roll of Burlap Ribbon as a gift from me! *FREE roll of Gold Cord as a gift from me! EMAIL ME AT MYPINKSTAMPER@GMAIL.COM FOR RETREAT PREORDER LINKS! **THIS RETREAT IS GOING TO FILL UP FAST SO RESERVE YOUR SPOT TODAY!! THIS IS GOING TO BE SO MUCH FUN!!! **I will be ordering this class on April 1st. Please allow 2-3 weeks for my package to ship. I’m sure it will be sooner but this is a HUGE project. My estimated ship date will be the week of April 15th. Don’t forget to email me all your substitutions within an hour AFTER you place your preorder!! What a bunch of goodness! Wow! What a class! I love the tote!!! I have to choose, This or john your team!! !